First of all, welcome to the IGEP Community Wiki! This is a collaborative site for developers like you that share their knowledge of the IGEP Technology. I don't know much about IGEP Technology.. You can visit the IGEP Technology page. You will find basic information about what is IGEP Technology and how it can help you with links to the main resources. I have a new board. How do I start? Do you just have a brand new IGEPv2, a IGEP COM MODULE, IGEP BERLIN, etc.? Pick the tutorial of your board in the tutorial guides, and setup you board with the step by step procedures. I just want to start developing Visit the Start developing under IGEP Technology page that will guide you through the available resources and to know how start developing. I have a specific question There might already be an article about it in the IGEP Community Wiki. Use the search box or check the FAQ, the Glossary and the Site Map. I can't find what I am looking for Please ask a question or leave your feedback in the IGEP Community Forum or the IGEP Community Chat. Check other available resources here. I need professional support Do you need support with your project? Are you looking for a custom design? Contact the ISEE Developing Team. The purpose of this page is to familiarize with the structure of this Wiki site, and to know how to find the information quick and simple. The Main Page of the IGEP Community Wiki is divided in two sections. This section consists of various links to many introductory articles about the IGEP Technology and the knowledge of its basis. 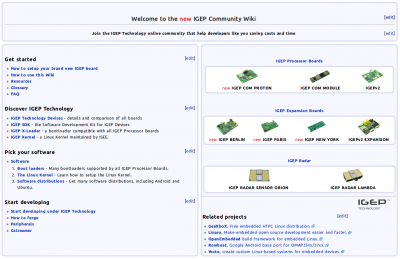 This section consists of direct links to Tutorials of IGEP Technology pages in the IGEP Community Wiki with step by step procedures that will help you to setup your board. This section pretends to be a quick access to the recent changes in the Wiki and other news related to the IGEP Technology, such as new versions releases, modifications, improvements, etc. 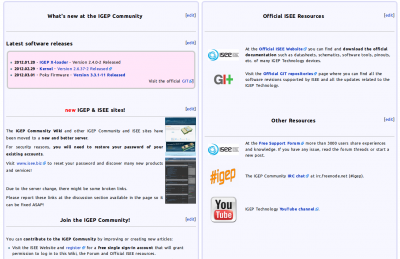 This section has direct links to other IGEP Community resources and other sites from ISEE, such the Forum, the GIT, the IGEP IRC Chat Channel, etc. The side bar is divided into several sections. There are external links to IGEP Technology Resources, such the IGEP Community Forum, the IRC Chat, the GIT Repositories and the Official ISEE Site. The are also links to Special pages, including the Wiki portal, a meeting point for all members of the IGEP Community that contribute with this Wiki. The information in this Wiki is sorted by categories. The main categories are listed in the categories page and there is a permanent link to this page at the sidebar. All the pages available in the IGEP Community Wiki are listed at the site map. Many resources related to the IGEP Technology are listed in the resources page. A set of answers to common questions in the Frequently Asked Questions page. At the top right of each page, there is always a search box. Use this search engine to find any content in the IGEP Community Wiki. Visit the ISEE Website and register for a free single sign-in account that will grant permission to log in to this Wiki, the Forum and Official ISEE resources. Consult the User's Guide and the contribution guidelines and start your contribution! When you are ready you can start creating or improving the work in progress articles. This page has been accessed 3,929 times.